The kidneys play a vital role in getting rid of harmful waste products from your cat's body. Many cats will at some point in their life experience problems with their urinary system. Smilla Finest Healthy Nutrition with Poultry was developed with leading scientific experts to help support cats with sensitive bladders and urinary tracts. The reduced protein and mineral content in Smilla Urinary cat food can have a positive effect on the metabolism, helping to reduce the amount of toxins your cat's body needs to proceΒ. 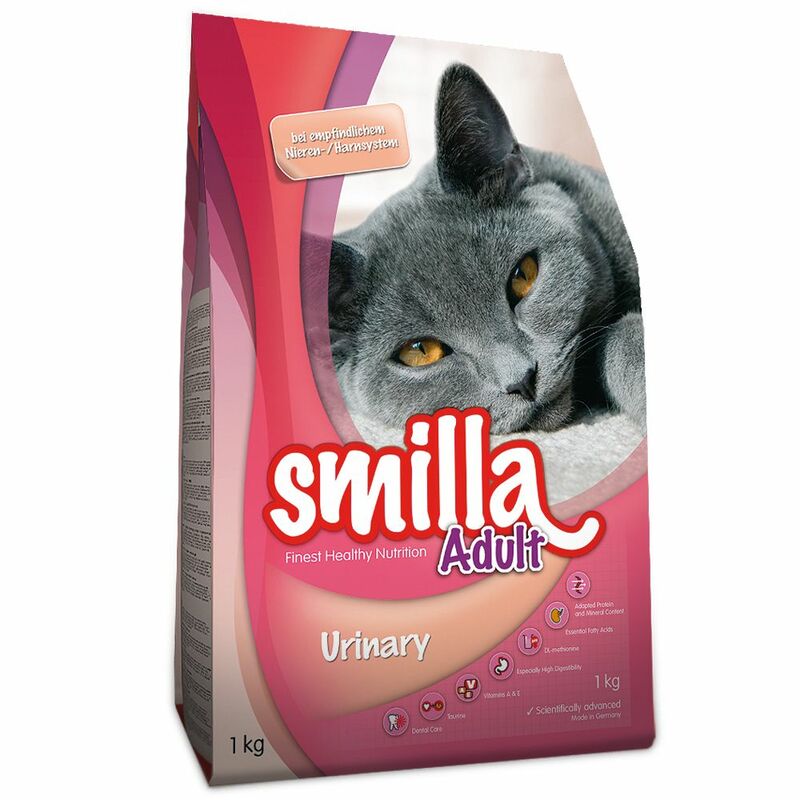 Smilla Urinary also contains DL-methionine, which helps to acidify your cat's urine, keeping it at a healthy pH value. This can help to prevent the build-up of cystine and urate stones. Smilla Finest Healthy Nutrition Urinary with Poultry: Balanced protein and mineral contents to help take the strain off your cat's metabolism EΒential fatty acids to support kidney filtration DL-methionine to help keep your cat's urine at a healthy pH value With vitamins A and E for good vision and healthy skin With linseed as a natural source of omega 3 and omega 6 fatty acids, for a gloΒy coat High digestibility for ideal nutrient absorption With vegetable fibres for optimal hairball proceΒing With high quality proteins to support organ functions With taurine for strong cardiac function and sight No artificial colour, flavouring or preservatives Non-GMO - part of a balanced diet No added sugar and lactose-free Smilla Finest Healthy Nutrition Urinary with Poultry is available in the following sizes: 1kg, 4kg and 10kg (2 x 4kg plus 2 x 1kg).